We’re in the year 2017. A lot has changed from the 80’s and 90’s when black lip liner and brown lipstick were the norm in Kenya. Also, remember the really white baby powder our mothers and aunties used to wear? Or if you were around at that time, you must have been a part of this movement. 😀 I’m here to help you break some beauty habits that make you look older than you are and to help you update your look. Let’s start,shall we? Where do I begin? I don’t mean to bash anyone. I mean to help. I come in peace. Don’t tweeze/shave/thread your brows too much. Just remove the excess hairs and shape your brows well. No need to shave off your brows completely then draw them back on. The modern brow is thick and more natural-looking. After shaping your brows simply fill them in using an eyebrow pencil, applying feathery strokes. Don’t apply eyebrow pencil in a line or use a brow product that is too dark. Use a shade that suits your skin tone and hair. Try this IMAN brow pencil here. 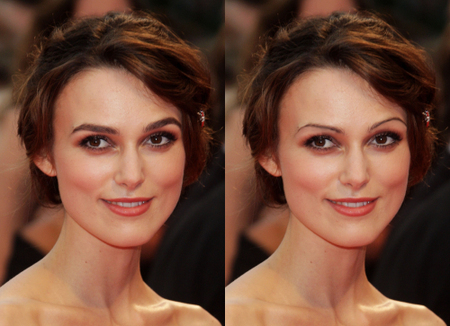 Actress,Keira Knightley with thin brows to the right, thick rows to the left. The left side looks better. This is a big no-no if you want to maintain the look of youthful skin. If you glop on large amounts of foundation on your face, it will settle in your fine lines/wrinkles. Even if you’re young, you may still have some smile lines around your mouth or wrinkles on your forehead because as a human being you do make facial expressions. Putting on a lot of foundation was a thing back in the day but the modern look consists of lighter face makeup.It’s all about keeping it young and fresh. Let your skin breathe girl! Try the lightweight Smashbox Hydrating Foundation here. This still happens. I still see women wearing dark brown or black lip liner and lighter lipstick. Lip liner is a very good thing when worn the right way. It keeps your lipstick on for longer. However, wearing really contrasting lip liner and lipstick, ages you.Badly. The proper way is to choose a lip liner that is almost the colour of your lipstick or choose a lip liner that is slightly darker. The difference shouldn’t be day and night. And if it is, you have to know how to really blend them together. If you love applying eye shadow like me, you know how essential blending is. 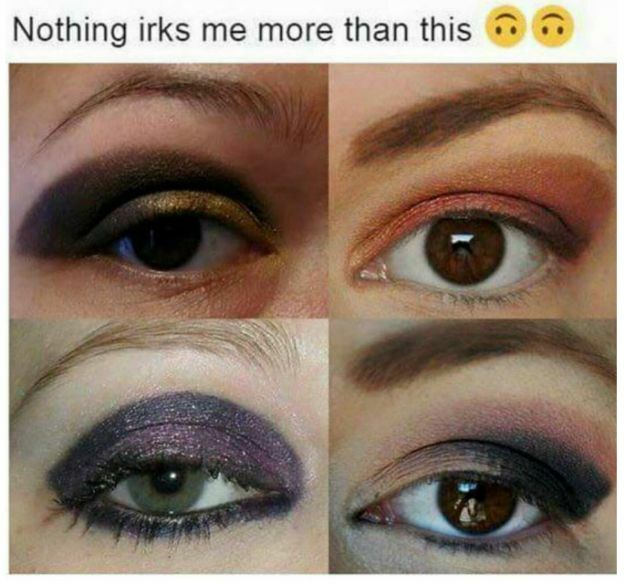 Eye shadow blending is an art-form. After applying eye shadow, make sure to blend it very well, using a blending brush. Make sure there’s no line of demarcation between the colours. Make sure they blend into each other as if they belong together. Try the Sigma E3 here.